Floyd Alton Krause was born in Berlin, Somerset County, Pennsylvania, in 1913, the third of eight children in a traditional Swiss-German-American family. His mother Annie (1885-1971) was raised Amish and married Charles (1884-1973), a Lutheran from Western Maryland. You can follow the young couple as they lived in several small towns in southern Somerset County and raised their eight children in an article entitled “A Journey Between Two Passages.” When Alton, as he was known growing up, was about 15, his father accepted a job as the caretaker of what was called “The Presbyterian Farm,” the predecessor of what is now Pine Springs Camp in Jennerstown, northern Somerset County. Along with helping his dad and brothers run the farm, he worked at the adjacent Green Gables Restaurant, part of the famous professional Mountain Playhouse. Alton even had time to play football while studying. Graduating from what is now North Star High School, Boswell, PA, in 1933, he soon began work as a laborer at U.S. Steel in nearby Johnstown, where he learned to be a welder. In 1937, with a good income, he married a Johnstown girl, Genevieve Overdorff. His metallurgical talents paid off when at the start of World War II he went to work at the Portsmouth Navy Shipyard in New Hampshire. By the end of the war he had taken a promotion as efficiency expert and inspector in the building of submarines for the Navy in Wisconsin. Soon the demand for ships was waning, and Alton and Genevieve moved south near his brother Ralph in Texas. He helped in his brotherʼs restaurant business, drove a milk delivery truck, worked on the docks, and did odd jobs for almost twenty years before moving back to Pennsylvania to work again in the steel mill. That lasted less than a year because, he said, the kids were always sick in the colder weather and wanted to go south again where it was warm. The truth is, according to his survivors, he just didnʼt like working inside the mill. So, it was back to Texas for a short time before moving north to find his fortune in far away Idaho. The highlight of this article are the summers the family spend searching for gold in the mountain streams above Leesburg. We have lots of exciting first-person accounts to share. Eventually, the Krause family moved one last time, to Wyoming. The year was 1966. But, his days in the real American West were cut short when in 1978 he had to have prostate and hernia surgery. No one expected his life to end as the result of a blood clot and heart attack that same year. The story of Alton and his family is a remarkable one, filled with love of God and family and service to his country and community. Letʼs go back and fill in some of the details, giving credit when we can to those family members whose memories we call on. How many young men can say that they hitch-hiked across the country? Alton did just that one summer with a friend and neighbor, Bill Ringer. According to his brother Lawrence, Alton used to hide his spare change in the springhouse on the farm. Heʼd stick his coins inside the metal pieces supporting the sides. When he decided to take off for the West Coast, he emptied the springhouse of its treasure, all but a quarter that his brother found and never gave back. Too bad he didnʼt record the details of that experience. If he left with little money, Lawrence says that came back with even less, working on a dairy farm to get enough for meals on the way home. Altonʼs sister Olive Adams wanted the world to know that he was generous too. She said that one New Yearʼs night on the way home from the Green Gables Restaurant where they both worked, he asked her how much she was being paid. 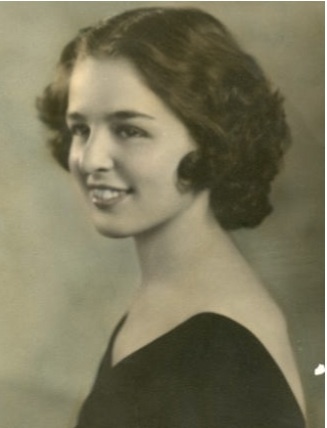 Olive replied, “Ten cents an hour.” At that Alton reached in his pocket and handed her a little more, saying, “Donʼt tell Mom.” Olive thought Mom might not let him work there if he were being paid more that his sister. Alton soon got a reputation and became known as “Mr. Worthmore.” Olive said that the restaurant owner didnʼt even let them keep their tips in those days. 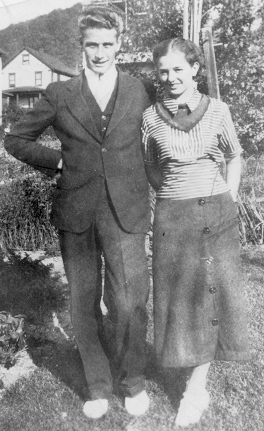 Alton and Genevieve met in the late summer of 1933, when she was camping at the farm with her family. 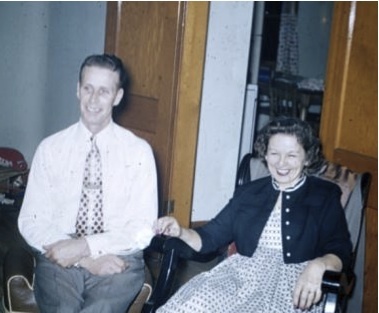 Apparently, Alton was discouraged from dating Genevieve because her parents wanted her older sister Ethel Lou to be married first. Olive claimed that brother Alton would “bribe” his brother Clyde and friend Bill Ringer not to say anything when the two love birds sneaked out on a date. Well, the couple was married four years later and Olive was a bridesmaid and Ethel Lou was the Maid of Honor. Daughter Debbie was born two years later, and Becky two years after that, just a month before the family moved to New Hampshire before the start of the war. Son Alton “Butch” was born in Wisconsin and another daughter, Sandy, was born in Texas. 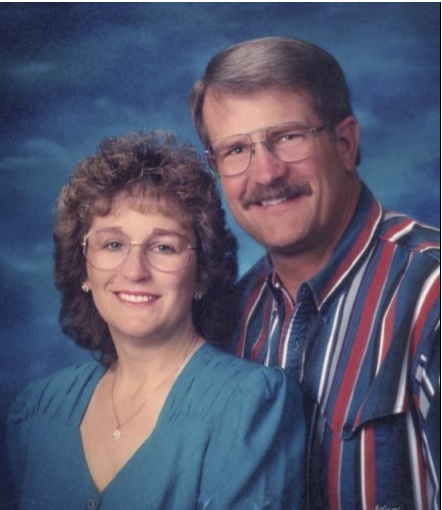 Little sister Cindy was born in Idaho before the familyʼs final move to Riverton, Wyoming. 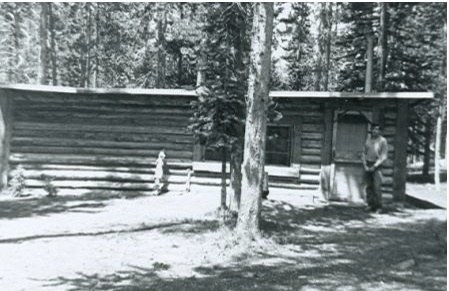 In a minute weʼll hear more about the move to Idaho, where Alton built a cabin in the mountains, staked a mining claim, and panned for gold every summer. But first, here are some first-person accounts by the children of what they remember about their parents. Letʼs start with Becky. Her recollections go back to what her dad told her about living through the War: “Dad served on a team when he was a submarine inspector. They were hooked somehow to the Navy but weren’t official Navy. They were called Civil Service. He wanted to join up and go fight but was told that it cost a lot to train an inspector, and if he went they would see that he had the lowest job they could find and they would keep him stateside. That’s Democracy for you. But then I don’t think he had the temperament for war. Of course, most of the other men didn’t either. But it was a heavy burden when they missed something and the submarine never came up.” One of the most unusual “careers” that Alton had was when they lived in Mathis, Texas. A friend, Dr. Jack Love, had opened a medical clinic there and got Alton a job as a butcher in a local grocery store. Later, Jack bought a small hospital, perhaps a clinic, and asked Alton to work for him there. After taking a beginners course in radiology, he helped Jack with whatever needed doing around the hospital. Alton jokingly referred to himself as “a doctor” and came home with amazing stories of broken bones and operations. Becky says, “We were the healthiest ever when we lived there because we were afraid to complain about anything for fear Dad would work on us.” Another story goes that a lady came in the waiting room asking for “the other doctor,” meaning Alton. After getting her into a room, Alton recorded her answers to basic medical questions while Dr. Love responded. Becky says that between the two “doctors” the lady got fixed up and went home. “At the end of the day Dad swept the floor,” laughs Becky. At one rental house in Texas the story goes that Alton offered to paint the place if the landlady bought the paint. Well, she did and he did and she ended up raising the rent because the house looked so much better. Becky says, “Dad got mad and we moved.” Dr. Love examined Alton one day because his arm hurt. It was determined that the chronic pain was probably from doing so much welding, and Alton was advised to quit. Perhaps it was carpal tunnel, which no one knew about then. But, Alton sarcastically said that if he had to quit welding, he may as well move to Idaho. Becky claims that her dad had seen beautiful pictures in hunting and fishing magazines. It was not always easy to read Altonʼs usually light-hearted mind from his comments or his pictures. 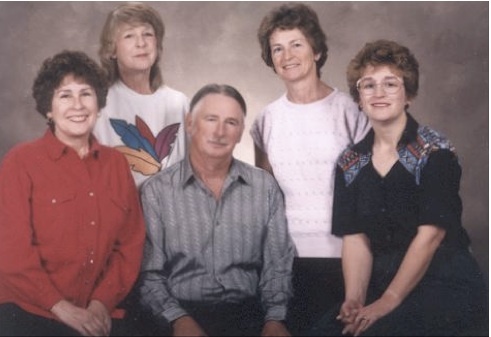 Becky claims, “Dad did look somber in his pictures. I think that was the way men were supposed to pose. But in real life he laughed a lot. As I said before, he laughed when he was with his family (brothers and sisters and father). When he was at a gathering in Leesburg he was always laughing and at the archery club in Texas. Thereʼs a picture of Cindy, on her first birthday when she smeared her cake all over her face, and he is laughing.” Becky says, “When Dad was alive, Mother seemed to always wear blue or some neutral color, because that was Dadʼs preference, and never slacks. Perhaps it was because of his ʻalmost Amishʼ upbringing. Itʼs the way Grandma Krause dressed. Recently, when Cindy recorded impressions of her dad, she wrote down, “He grew up on farms, working very hard. He liked animals – we had rabbits, guinea pigs, ducks, chickens, quail, cats, dogs. Girls liked him because he was fun and good-looking. He loved to fish and hunt and whistle little tunes. He enjoyed rock hunting, archery, ice skating-hockey, golfing and flying. He had his own airplane for a while. He loved poetry and made up little ditties – some off-color. He helped me memorize poetry for school. Letʼs talk more about Alton and the Krause family’s prospecting days. 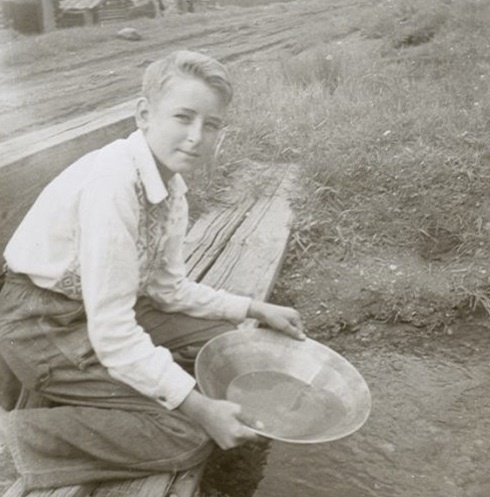 According to Becky, while her dad and brother went to scope out Idaho those many years ago, someone taught them how to pan for gold. After they moved, Alton bought a big tent and backpacks and others items that would be needed in the wilderness. She says, “He got a rinse tub and taught us how to pan for gold in it. He set the tent up in the back yard first so he could see if it was big enough. The next summer we set off for the mountains with a boxer dog, a cage full of parakeets, and a trailer holding all the belongings we thought we needed.” For the full details of the move and incidents that happened over those memorable summers we will refer you to several short, first-hand accounts of life for the Alton Krause family on the mountain above Leesburg, Idaho, written by Butch and Becky. But here are some highlights, beginning with Butchʼs story. 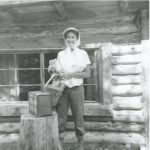 He begins with this lead: “Finally finished in the summer of 1957, the Krause cabin nestles just several feet from the small creek that beckoned, “come here! Come here! I have riches for you. I can give you great wealth. I can give you Gold ! “ How many times and how many places has that specter beckoned to people with itsʼ outstretched hand and itsʼ whispering, ghost like, voice? The few times it did yield riches were decoys to entice and trap countless thousands of hapless souls who would invest time and lives in quest of this promised, Holy Grail.” Butchʼs complete work is entitled, “Quest for Yesterday & Uncle Tomʼs Cabin.” Hope you take time to read it, then come back here for more. In 1955 Alton began work on a more comfortable and permanent abode near the claims, which Butch describes this way: “Our cabin was not large. I would guess approximately 15 feet by 25 feet. Upon entering the door you would find yourself in the main room. To your left was a wall, which divided the cabin into the main room and one bedroom. In the bedroom there was a double bed frame made out of logs for Mom and Dad and a triple-decker bunk bed for us kids. Now, a triple bunk bed in a room approximately eight feet high would not allow much room in any one bunk. The bottom bunk was about two feet off the floor, the second approximately four feet off the floor and the third at six feet. Our closet room was a wooden apple crate at the head of each bed for us kids and I do not seem to remember what the folks used. Back to the main room. The main room had a large window in the front, center of it. It was composed of glass window panes set in a frame made of boards. The panes were taken from the mill at Devlin Falls on Napias Creek and carefully wrapped to make the safe journey four miles from Leesburg to our cabin site. Memory seems to tell me there were probably enough panes to make a window about three feet-high and about six-feet long. Approximately 18 panes set in the framework Dad made for the window.” Interestingly, with no electricity, the cabin had a “window box” through a small opening in the wall to the ourside. This served as their refrigerator in the cool air of the mountains. What didnʼt fit there could be placed in the ever-flowing spring, about 200-feet up hill, in five-gallon cans. In her short story, “Strolling in the Mountains,” Becky describes some of the pleasures – and dangers – of living in the minersʼ cabin above Leesburg. The whole family would take a day off and walk the four or five miles to town. They would visit friends and go fishing. In those days the government price for raw gold was $20 to $30 an ounce, but one neighbor was willing to pay $35 just to establish a claim. So, there was some spending money. It wasnʼt all fun though, says Becky. She tells of her sister Debby and the family dog Max encountering a bear one day on the way back to the cabin. She thought for sure sheʼd have to use her bow and arrow to defend themselves. But, instead of barking and chasing the bear, Max took off for the cabin. When Debby saw the bear head in the other direction, she too ran full speed behind Max. Another time, the kids had been fishing in Leesburg and got a late start home. As the sun set and the shadows lengthened, the coyotes started howling. Becky says, “They sound a lot different when you are out in the dark with them than they do when you are in a cabin. Infact, they sounded like they were behind every tree. And they kept getting louder and closer, louder and closer. We had to walk about two miles listening to the coyotes behind all the trees. After that we always made sure to be home by dark.” Beckyʼs essay closes by revealing how so many of her old friends in Leesburg had died: some from old age, some in plane crashes, and several were found frozen to death in the mountains, either in cars or their cabins. In 1966 Alton & Genevieve moved for the last time, to a wonderful little western town just below Yellowstone National Park, Riverton, Wyoming. I remember taking my own young family to visit one summer. These Krauses used to comment on the many green trees fighting to see the sky when they visited us back East, but my impression of their space was that of a few pines and aspens looking up into Wyomingʼs “Big Sky.” The earth was a dusty brown and Jay and Sandy were constantly redirecting the small irrigration ditches to water their garden crops. The sheep seemed to play “King of the Mountain” behind the Krause house. That short visit left a lasting memory with my family, one of stepping back in time similar to the way our American pioneers must have experienced the West. This brings us to the end of our tribute to the Floyd Alton Krause family that began with his birth in the mountains of South-Central Pennsylvania just before World War I and ended with his early death in the Rocky Mountain foothills of Wyoming shortly after the Viet Nam War. 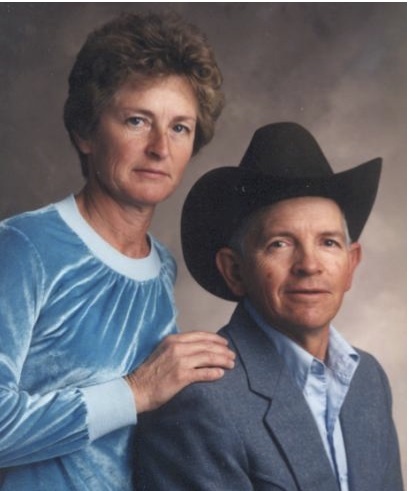 But while the world may have been in conflict at times during his life, and Alton had proudly served his country during World War II, he found a peaceful place in the American West to raise a family well, instilling in them the hopes and dreams of a life well-lived. 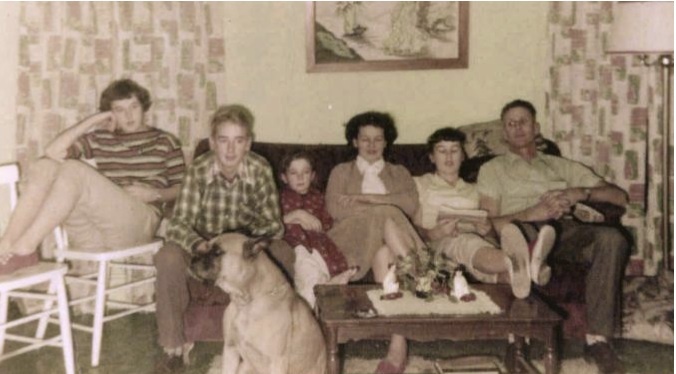 The “Gold in the Hills” that this Krause family found was no doubt more valuable than shiny metal; it was realizing all that life has to offer beyond material possessions. As the family and friends who knew and loved Alton read these accounts, no doubt additional stories will come forth, and weʼll post them on this page, but for now, our desire is that you read and re-read what we have so far and share the adventures of this unique family with others. It spins and makes a throbbing, humming noise, this time machine of mine! I face into the breeze, close my eyes, and find myself back in time, where I rock my babies to sleep and fall asleep myself while still holding them. I fish for wild trout in Wyoming with my father and my son. Pleasant times when my mother and I would drink coffee at 4:00 AM and talk of life and people. I hold a young woman in my arms, the one I will learn to love and will grow old with. Grandchildren play around me, making me feel very old, and, at the same time, very young. I can smile as I stand on a mountain top which is dressed in winter plumage of white, realizing that only through this marvelous machine will I ever do so again. Now is when I realize my need for solitude and solace for my soul. Facing the awesome realization of the power of God, I begin to understand my own mortality. All this and more… much, much more… as I sit by my fan in my quiet times. Sometimes sleep creeps in as subtly as a thief in the night, robbing me of the pleasure of pleasure. My sleep robs me of the delusion of being contented as the fan continues to caress my face, and this ʻtime machineʼ caresses my soul.